Mr. Campsall explains to Miss Inez Wooten that Mrs. Ford saw shawls on display and wishes to be sent samples and quote prices. 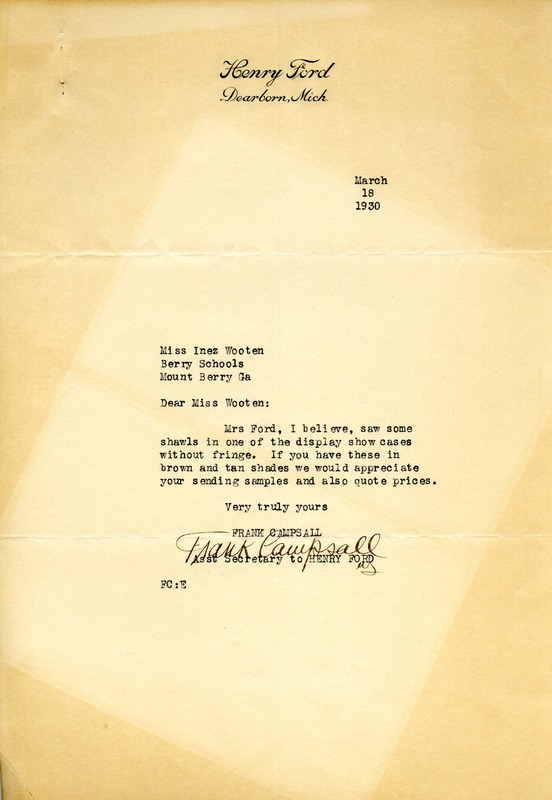 Frank Campsall, “Letter to Inez Wooten from Frank Campsall.” Martha Berry Digital Archive. Eds. Schlitz, Stephanie A., Chelsea Risley, Meg Ratliff, Bob Williams, Jordan Nale, et al. Mount Berry: Berry College, 2013. accessed April 21, 2019, https://mbda.berry.edu/items/show/11980.